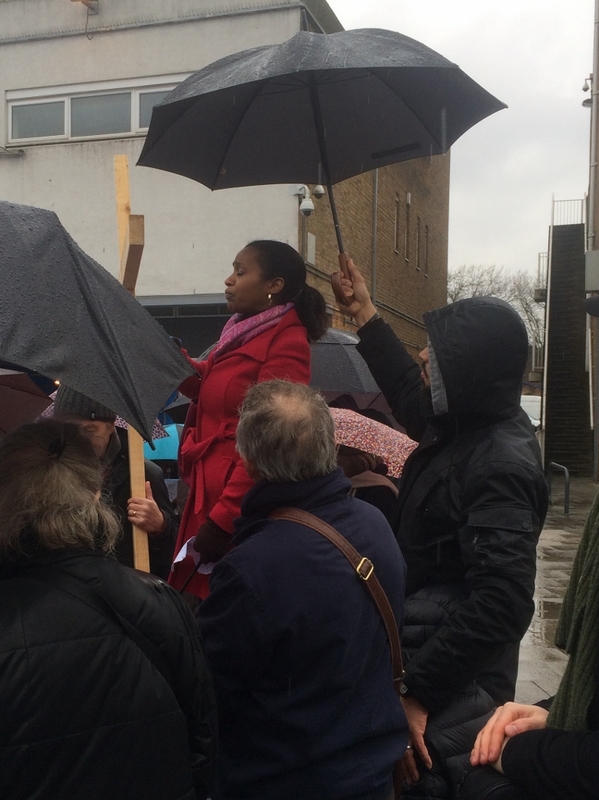 At the open air service on Good Friday at the Blue, I spoke about two men who had been in the news this week. 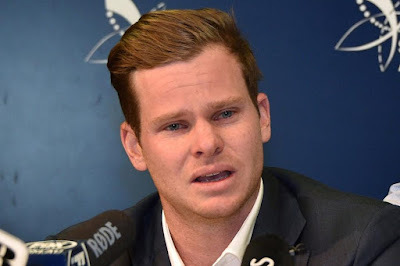 The first, Aussie cricket captain, Steve Smith, who had tearfully confessed to ball tampering live on national TV, breaking down in tears when he thought of the effect the scandal had on his family, not least his dad who was standing beside him. The Australian PM has branded the team a national disgrace, and abuse has been heaped upon them from all over the world. Today's Times reported Smith saying he would regret his actions for the rest of his life and that he hoped in time he could earn forgiveness. For Steve there is some real good news - and how I pray God brings some Aussie Christian across his path to share it with him - he doesn't need to earn forgiveness. Indeed, he never could even if he tried, but, here's the real great news: Jesus can wash his sins away. And when the God who made you says your sins are forgiven, they are. Forever. paid with his own life. The President of France described him as a hero, but the French Ambassador to the UK, went further. He told the BBC that Beltrame was a Christian martyr. Beltrame grew up as an atheist but became a convinced Christian in his thirties. 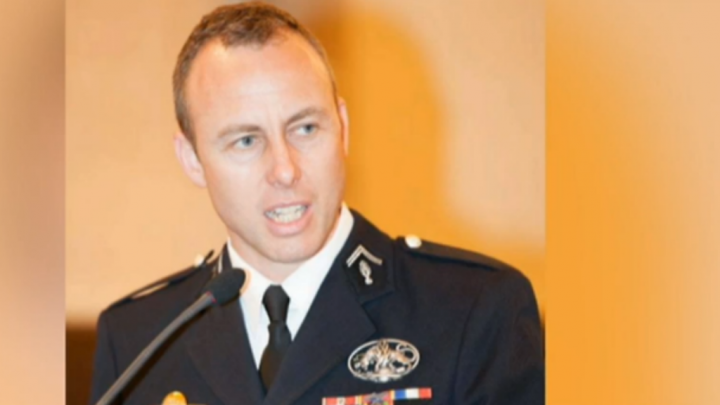 The chaplain to the French police said that Beltrame radiated his faith. and lived it out in his life, including that day just a week ago, when he gave his life to save another. That's right. 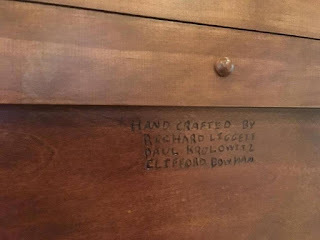 That's what Beltrame did, and his inspiration was his Lord and Saviour who did exactly this on the cross. That brings us back to Good Friday at the Blue and the wonderful Good Friday message of hope: whatever you have done, God can wipe away your sins COMPLETELY. And all that is because when we were hostages to sin, death, and the devil, Jesus swapped places with us. 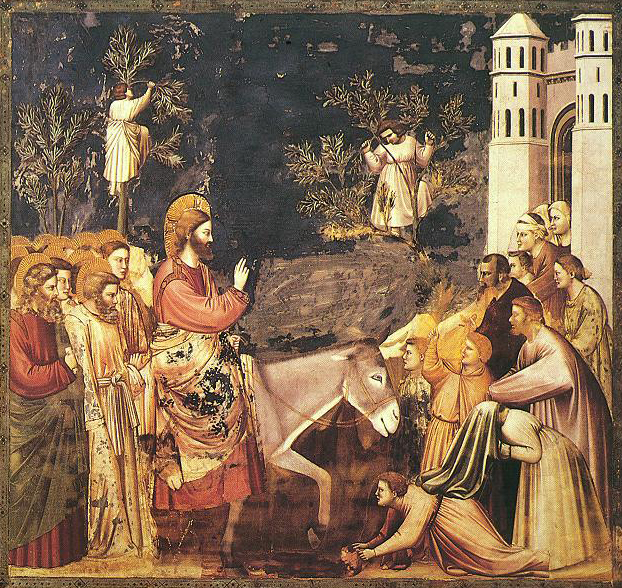 Our God, clothed in human flesh, took our place to set us free. Greater love hath no man than this. God so loved the world, that he gave his only Son, so that everyone who believes in him may not perish but have eternal life. It really was a good Friday, when Jesus achieved that for us. 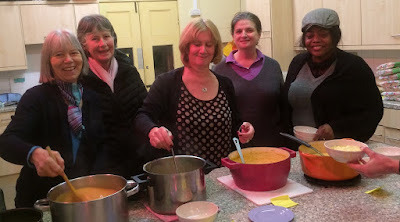 Here's part of the great team from St Anne's who hosted our Maundy Thursday Lord's Supper celebration for St Mary Magdalen, St Anne's and St James. 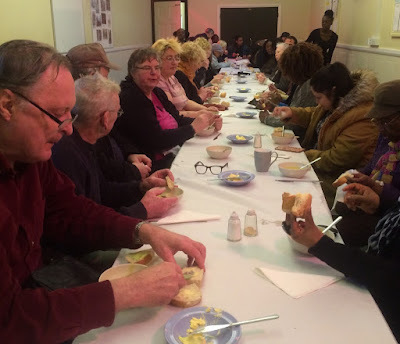 St Anne's Hall was packed for this well loved annual event where we sat down for a meal together in the context of a celebration of Holy Communion. 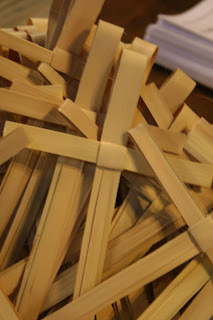 Like the first disciples we then 'sang a hymn and went out' (Mark 14.26). Charlie from St Mary's led the service - you can just about see him through a sea of umbrellas - and I preached, and three people, Friday from St Mary's, Ruth from St Anne's, and Sir Simon Hughes from St James shared what Easter meant to them. It was great to be out in the Blue Market, at the heart of Bermondsey, proclaiming the message of Christ crucified, that God God loved the world so much that he gave his only son so that whoever believes in him may not die but have eternal life. After all that, with the rain lashing down, and the temperature reducing, it was time to walk to St James. 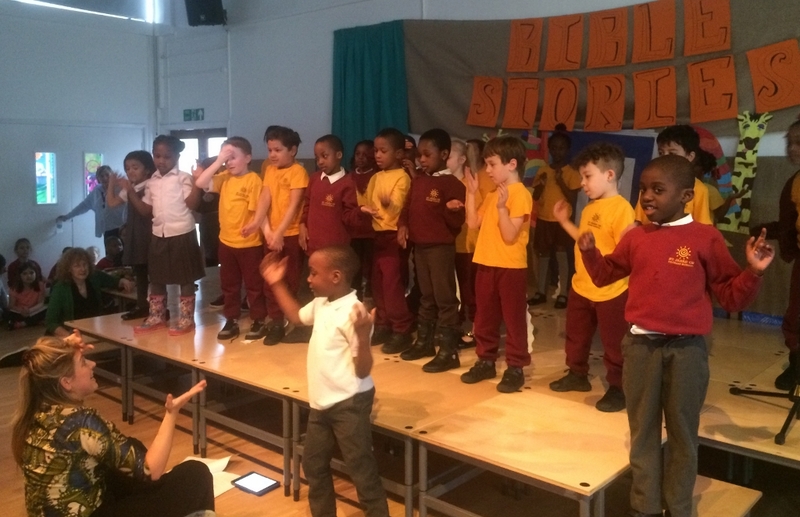 It was one of our best school services ever, all planned by the Junior Faith Group. 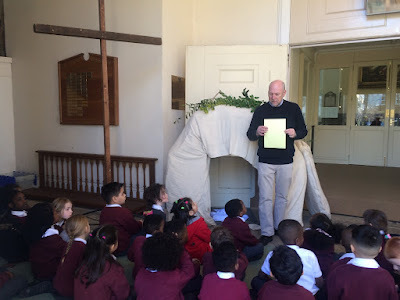 Paul told us about the events of the first Maundy Thursday, with the members of the JFC taking the place of Jesus and the apostles at the last supper. The JFC led the prayers. The winners of the Easter poem competition read their winning entries. Key Stage 1 gave us a reprise of two of their songs from their brilliant Bible Stories end of term production, and then the whole school joined in our final song, Lord of the Dance, complete with dancing by some of the key stage 1 children, sendinh us out on high note to the holidays and the celebration of Easter. 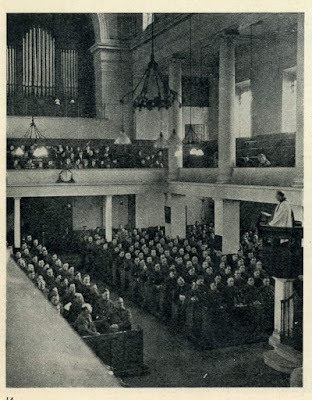 Sunday March 23rd 1941 and servicemen crowd into St James's Church for the National Day of Prayer, called at the height of wartime hostilties. Many of the men are from the Home Guard Unit of the Southern Railway, The photo features in a book about that unit shown to me today by Peter on a funeral visit. I am grateful to him for this fascinating insight into Bermondsey history and the reminder that as the bombs rained down on London, a nation prayed. Children from the reception classes and years 1 and 2 from St James's School came to church today to learn about the Easter story. 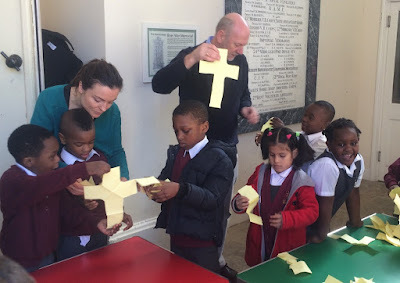 Nearly two hundred children, a class at a time, came to learn about the cross and the empty tomb (we had constructed our own version in the church narthex), and then took part in a craft activity, involving an ingenious combination of paper folding and tearing which produced, much to the children's delight and surprise, a cross, which they could take home as a reminder of the day. The visits were the idea of the Junior Faith Group who have helped plan our end of term service in church on Thursday. It was Palm Sunday at St James, the clocks had gone forward an hour but the church was quite full, the palm crosses were ready to be distributed to the congregation, and Ivan, Reader in training on placement with us from Holy Trinity Rotherhithe, was all set to deliver his Palm Sunday sermon, and then to round everything off nicely we ended with a spot of proleptic singing. Two definitions from the online dictionary give a clue: (1) the representation of something in the future as if it already existed; (2) the use of a descriptive word in anticipation of it becoming applicable. Our proleptic song was 'The Greatest Day in History.' We shall sing it next Sunday, too ('The greatest day in history, death is beaten, you have rescued me. Sing it out: Jesus is alive. Life eternal, you have won the day') but we ended on it for Palm Sunday (a) because every Sunday is a celebration of the resurrection and Jesus is already risen and (b) because even as we travel through Holy Week, reliving the events of betrayal, mocking and death, we know that Jesus will live again because God has said so. 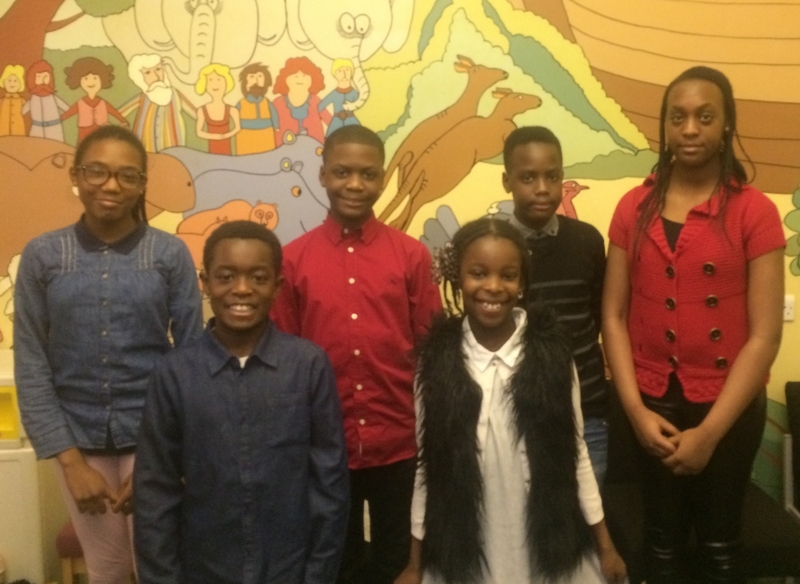 Here are six of the nine young people from St James and St Anne's who are going to be admitted to communion during the Easter season. They are all in year 5 and above and they are part of the first tranche of baptised youngsters to be admitted to communion before confirmation in our benefice. 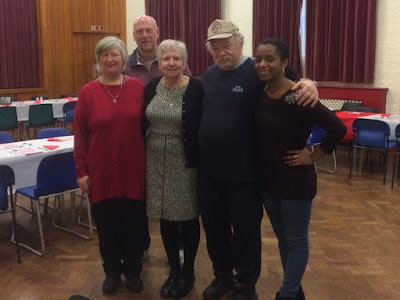 They've been taking part in a preparation course after church and on Easter Day (at St James) and on Sunday 22nd April (at St Anne's) our candidates will be admitted to communion, and from that day onwards will be able to receive the bread and wine of Holy Communion as we 'do this in remembrance' of Christ. In due course, they will come to Confirmation and make for themselves the vows that were made by their parents on their behalf at their baptism as infants. 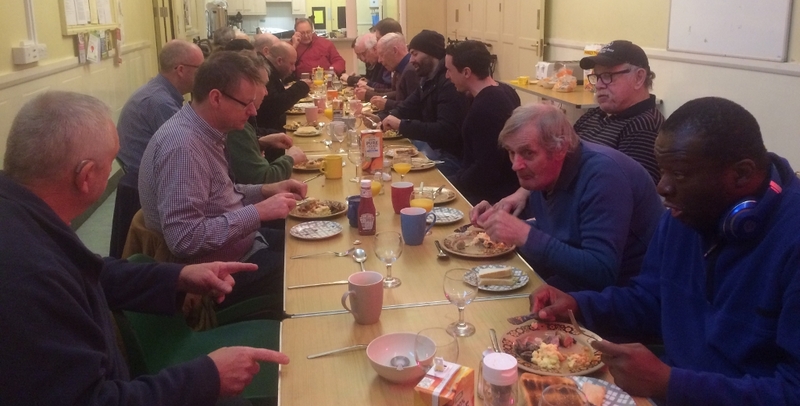 Andrew Cannon (left) was the speaker at today's Men's Breakfast at St James. Andrew is currently a student teacher, previously he headed up the London City Mission's work here in Bermondsey. A full cooked breakfast was followed by Andrew's stimulating talk. He shared a bit of his own story to faith and then encouraged us to get involved in communicating with people in our culture who might be yearning to know the reality of God, without necessarilly even knowing that is what they are yearning for. 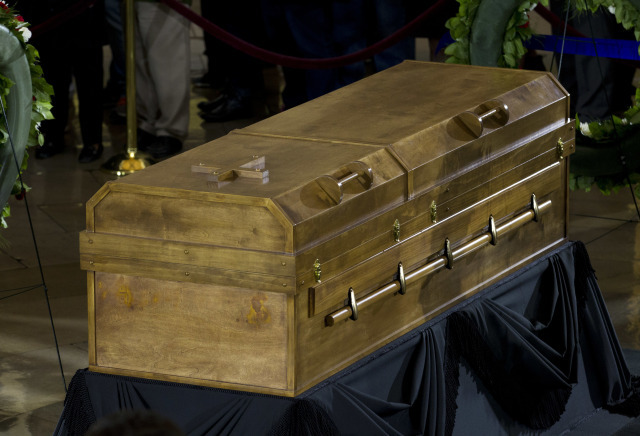 He encouraged us to feel confident in the truth of the Christian faith, and to see that it stood up to examination and questionning, as well as fulfilling people's deepest longings. They took some of the greatest stories of the Bible: Noah, Daniel, Jonah, and Joseph. 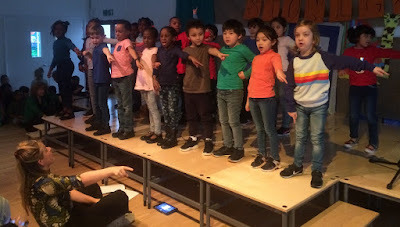 Then they told them to us in word and song, at this afternoon's wonderful production at St James's School by years 1 and 2. Afterwards one of the mums told me she was so pleased that her daughter was learning all these stories from the Bible. Here are a couple of clips (firstly from the story of Jonah; secondly from Joseph) - excuse the wobbly camera work. 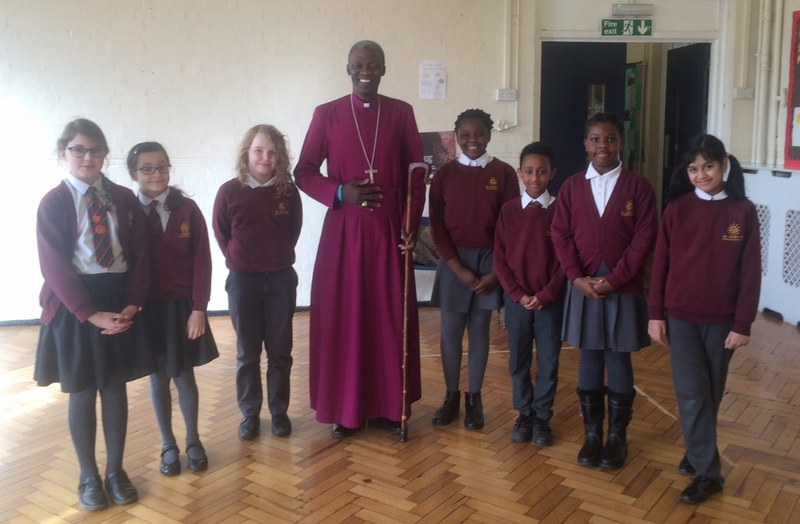 To St James's School for a meeting of the faith group. 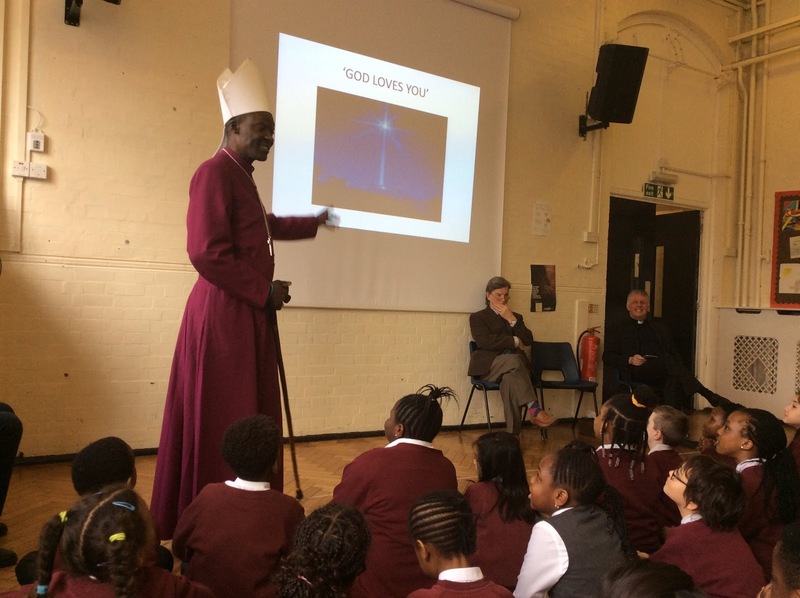 The Faith Group is a committee of the school governing body and it has a special brief to oversee the Christian character of the school. At our last meeting we were reviewing the school's Religious Education programme, today our focus turned to collective worship and to a review of our Collective Worship Policy. 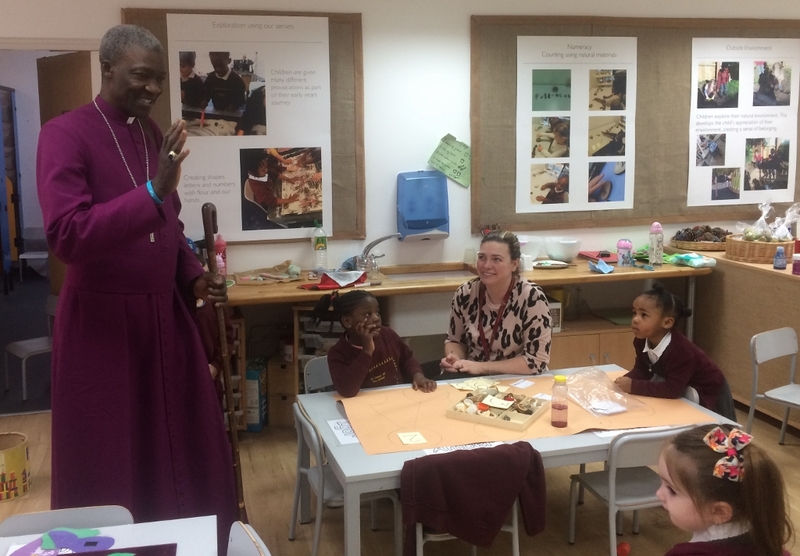 The policy says 'worship is essential to the life of our school and plays an important part in the fulfilling of our role and mission as a Church of England school.' 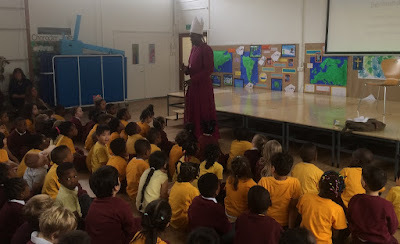 What we call 'assemblies' are more properly called 'acts of collective worship' in a CofE school. It is excellent that each school day can start with an act of worship, as we recognise God's presence with us ('The Lord is here: His Spirit is with us') as we hear from his word, the Bible, and as we pray to him our loving creator and heavenly father. Penny, Paul and I lead the assemblies on Tuesdays; on other days they are led by the senior leadership team, or by class teachers if there is a class assembly that day. 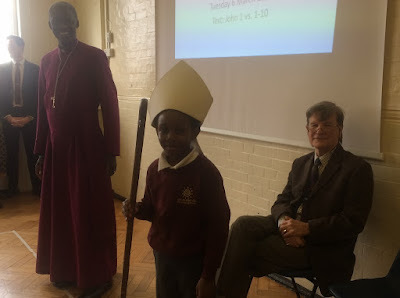 Then we have our special whole school services in church - the next is on Maundy Thursday (planned jointly with the Junior Faith Group), the last day of term. With nearly 600 children in the school, our services in St James's Church are the only time that the whole school can meet together., and that makes them extra special, as does the various ways the children themselves are involved in singing, dancing, reading and planning the service. 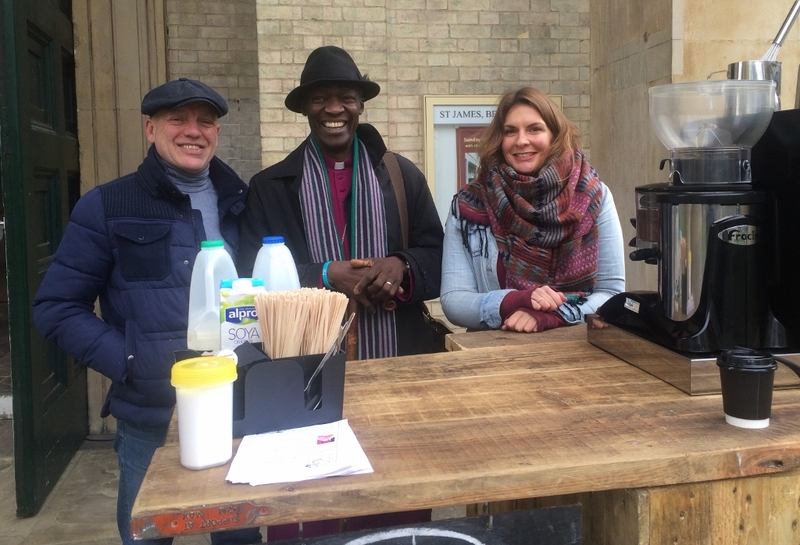 When he came to Bermondsey last week Bishop Karowei didn't just visit St James's School, he also blessed David Davoll's new coffee venture (left) in the church portico. 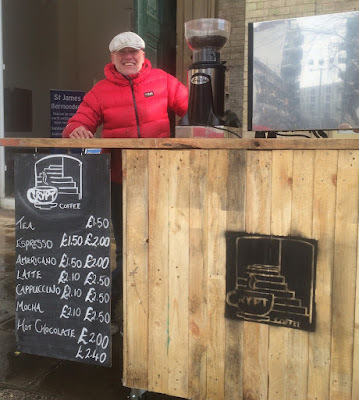 From 7am every morning until 12 noon David is out with Crypt Coffee, serving coffee, tea, and hot chocolate to commuters, dog walkers, and others using the Churchyard. The Bishop loved the idea, he had a great time chatting to some of David's customers, and then we all prayed, as Bishop Karowei asked for God's blessing on this great new project. Congratulations to Michael & Caroline, married this afternoon at St James's, our first wedding of the season. 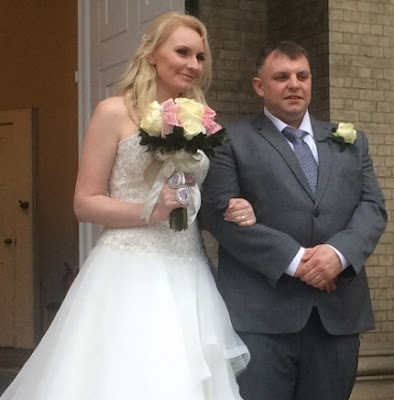 2018 looks like being a boom year for weddings at St James, with bookings up a massive 120% on last year. It's is British Pie Week and the Daily Telegraph has been profiling a Bermondsey Institution (left), Manze's pie and mash shop (see here). 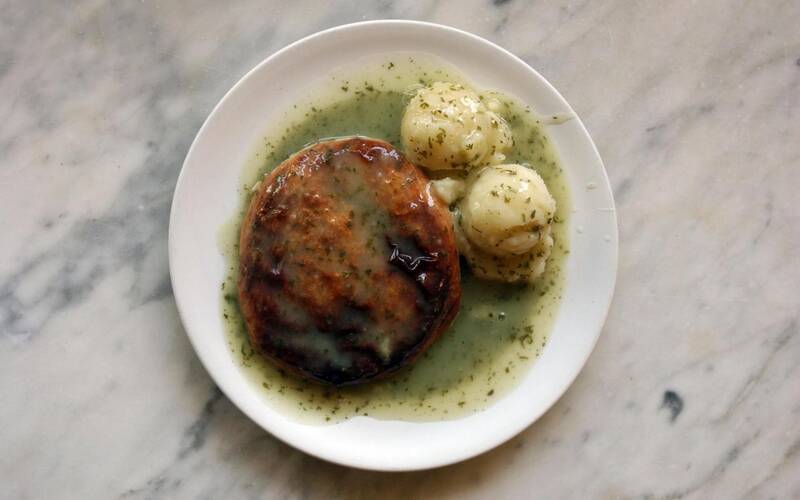 When I came to be interviewed for the post of vicar in Bermondsey and I discovered they were serving the candidates pie and mash for lunch, I knew I had applied to the right parish. Famously proper pie and mash is not served with gravy (though I quite like it with gravy), but with that traditional green parsley sauce, known by all Cockneys as 'liquor.' (Add some vinegar, and eat it with a spoon and fork if you want to do it properly). And everyone knew exactly what she meant. 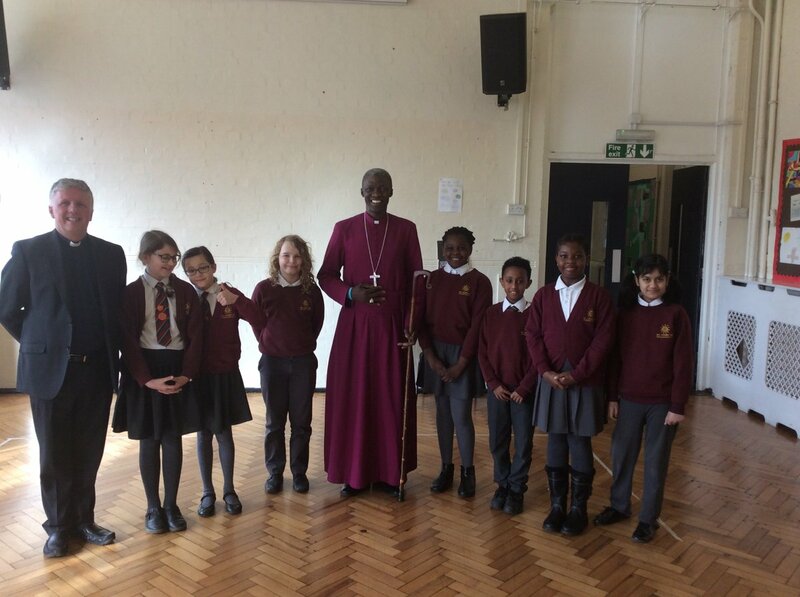 Lovely photo tweeted by St James School of the Junior Faith Group meeting with Bishop Karowei yesterday. 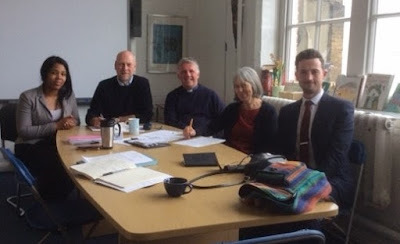 The JFC, parallels the Faith Group of the governing body. They are bursting with ideas for the end of term service in church and I am looking forward to meeting with them soon to plan it. Bishop Karowei, the Bishop of Woolwich, and our area bishop came to visit St James School this morning and to speak at all three assemblies: the first two at Alexis St for Key Stage 2 (left), and the third at Old Jamaica Rd, for Key Stage 1. His message was the love of God. 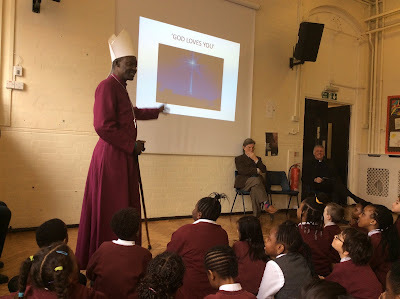 In his wonderful talk, his warm smile, and the interest he took in every adult and child, he eloquently conveyed that message to the whole school community. As a school we felt blessed by this visit from the shepherd of the flock, so a big thank you, Bishop Karowei, from everyone at St James's School. 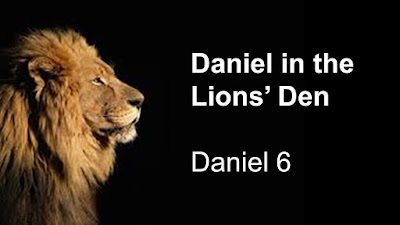 Yesterday we came to the end of our six week sermon series on the book of Daniel, with the story of Daniel in the lion's den. “Greetings! I command that throughout my empire everyone should fear and respect Daniel's God. “He is a living God, and he will rule forever. 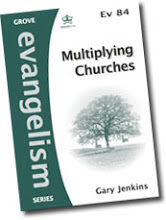 In the whole book, several themes have emerged over and over again, about living faithfully for God in a strange land and in the face of opposition. As we continue, our focus on discipleship here at St James and St Anne's, we have learnt a lot from the book of Daniel. convicted murderer, Richard Liggett, and two of his fellow inmates. At the request of Billy Graham's son, the names of the three prisoners are burnt into the side of his father's casket. The Graham family has long been involved in gospel work in the Louisiana State Penitentiary, the largest maximum security prison in the world. Billy Graham preached to presidents and prime ministers, and millions of people across the globe, but he didn't forget some of his nation's most forgotten people: its prisoners. 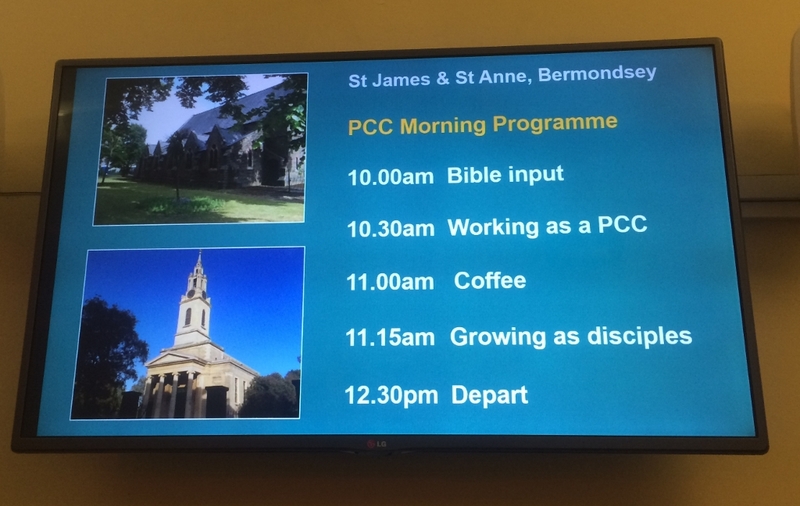 Our two PCCs (church councils) for St James and St Anne's met today for a morning focussed on the subject of discipleship. We started off with a full cooked breakfast of the kind that has become so popular with our men's breakfasts, and then with some physical nourishment under our belts, we turmed to the Bible for some spiritual nourishment from Ephesians 4.1-16. The final goal is that we become mature in Christ ('no longer ..children, carried by the waves and blown about by every shifting wind of the teaching of deceitful people') by speaking the truth (ie the truth of God's word) in love. 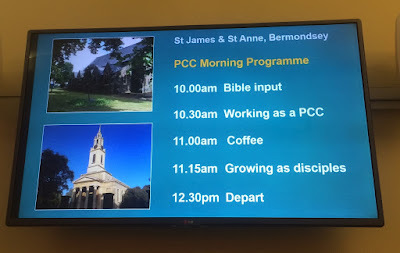 After our bible input, and before coffee, we spent some time thinking of our particular responsibilities as PCC members, including looking at Ten Commandments for PCC members, and then we turned back to the subject of discipleship for the rest of our morning. 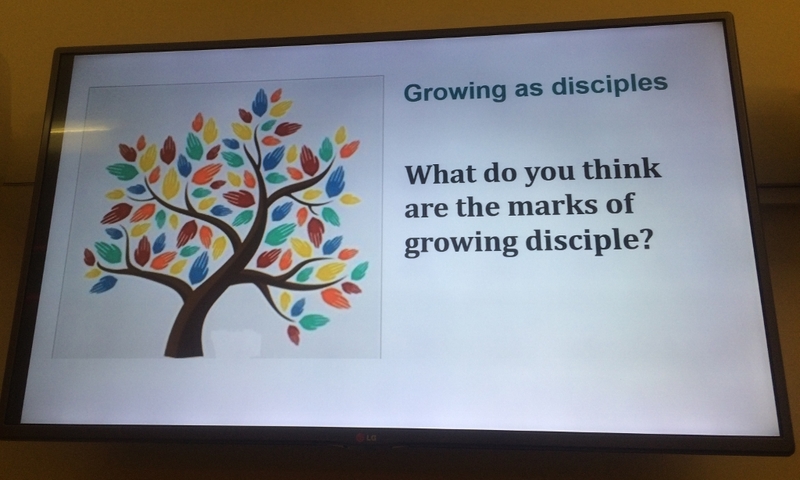 In small groups we looked at these three questions and then fed back our answers: (1) What do you think are the marks of a growing Christian? 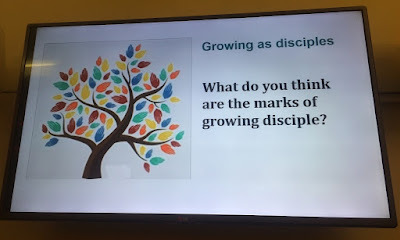 ; (2) What would most help you grow as a disciple? 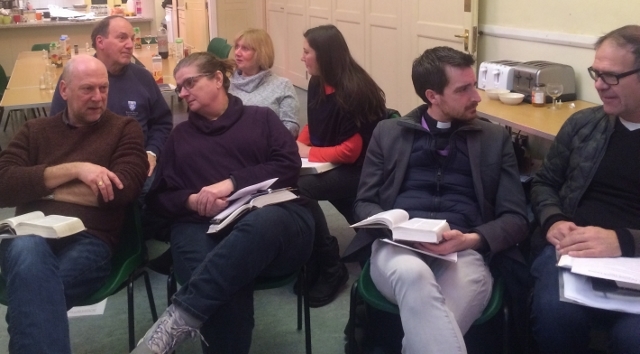 ; (3) What do you think St James and St Anne's should be doing to help people grow as disciples?. The results will be collated and we will think further about this vital matter. 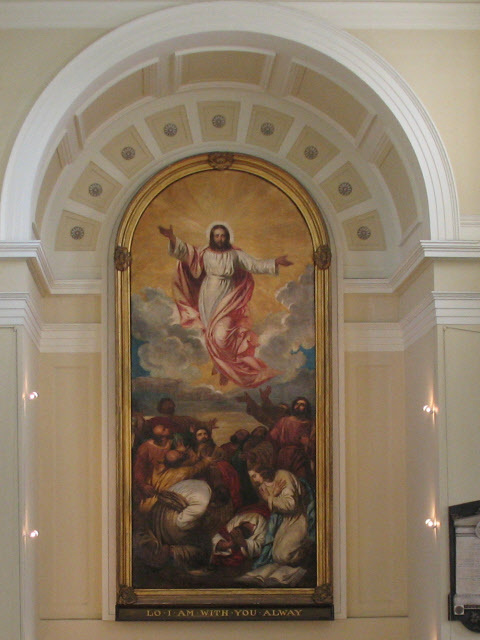 After all, the parting shot of Jesus to his church, commemorated in our Ascension picture in St James with its the text from Matthew 28.20 was to 'go and make disciples' of people from all nations. It was the first day of David D's new coffee based venture in St James's Churchyard. The snowed poured down. The air temperature was well below zero, but David and his team carried on regardless. And for the first day only, everything was free. From next Monday David will be there from 7 o'clock every morning, offering some welcome refreshment to people on their way to work - and while they're at it, they can can pop in for a look around the church (which is not usually open at that time), or even start the day off with a quick pray. (PS: I can personally vouch for the excellence of David's hot chocolate).